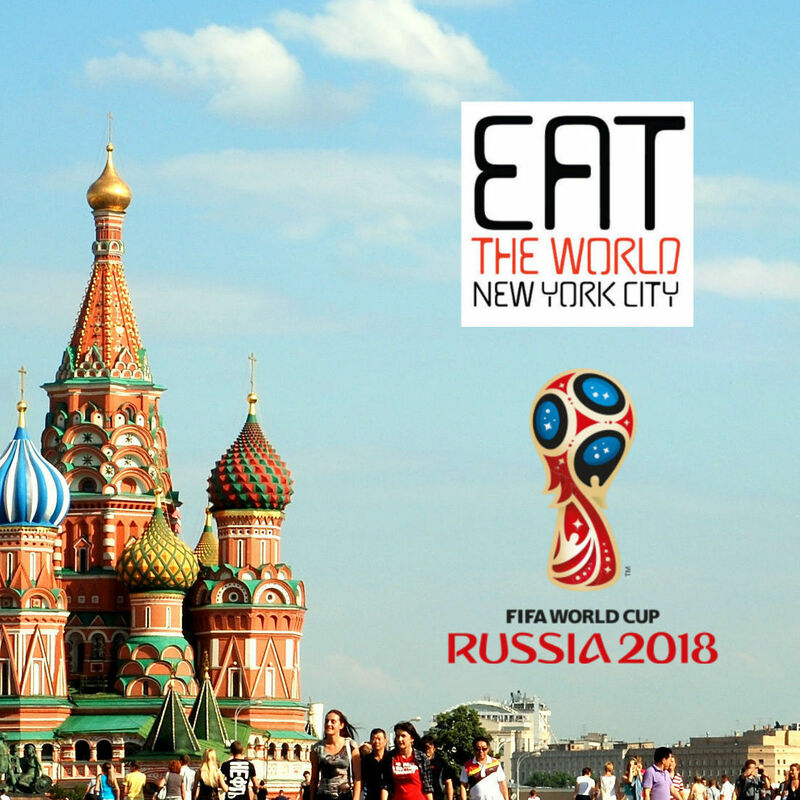 While out doing the legwork to try and find Russians excited about the upcoming World Cup, I instead found something very different but actually more important to New York City. 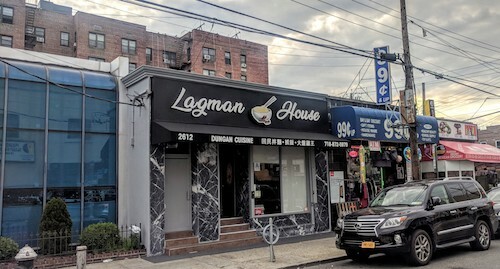 On the awning in both English and Chinese scripts was the announcement of Dungan cuisine, a first in the city, and according to our friendly server a first in the entire country. Dungan peoples are Muslims of Western Chinese origin, different from the Muslims in Central Asia of Turkic origin that are usually associated with the countries in this region and Xinjiang in western China. They migrated away from their homelands starting in the 1800's because of various persecutions and have always been stateless. They have their own language and long history, and it is with absolute joy that we can welcome their cuisine to Sheepshead Bay, Brooklyn. 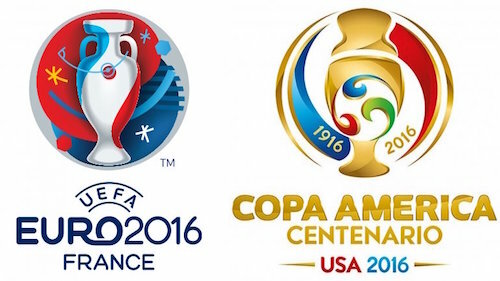 The space was quickly turned over from its previous tenant, a forgettable Azerbaijani restaurant. "50 shades of tan" is the best way to describe the bare bones design, but once the menu is placed on the table, the magic is far from the atmosphere. Like many other restaurants in the area, feel free to BYOB here. Other Dungan families, speaking to the staff in a language that almost sounded Mandarin but not quite, all brought bottles of wine and spirits to accompany their meals. We were warned about the sourness of the cold Dungan-style salad ($6.99, above) when it was ordered, but this seemed to be out of experience with their Russian customers' reactions. It was certainly on the sour side, but it was enjoyed enough to order a second plate later in the meal. Our server suggested it be used to combine with the noodle dishes as a garnish. Dungan-style samsa ($6 for 2, below) were served with a side of deep red sauce (not pictured). 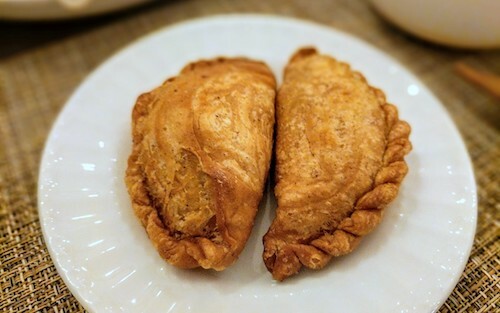 The flakiness and texture of the shell are wonderful enough to order this, but the insides and surprisingly good sauce make it almost jaw-dropping. 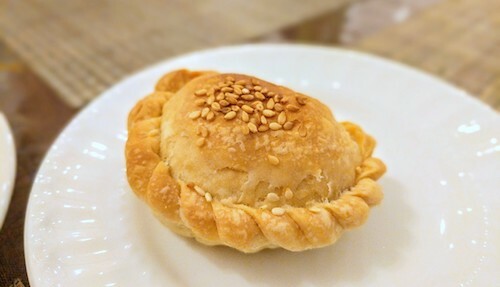 These samsa take much more care and time in preparation than "normal" Central Asian versions, so this is the reason for a bit of higher price. As the name of the restaurant might suggest, noodles are king here, and all house made. Do not feel bad about ordering multiple dishes that could all be considered soups. 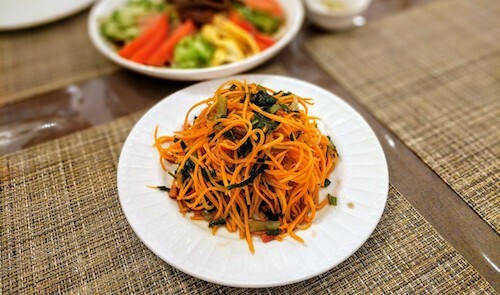 Sharing is a bit of an issue, but they are fine bringing small bowls for everyone, and you would not want to miss out on these delicious and very long noodles. 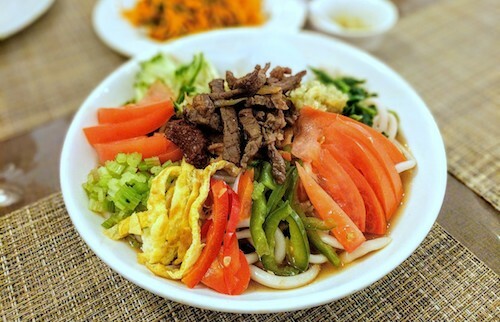 The first selection was a cold noodle "soup" called ash lan fyn ($9.99, below), noodles in beef broth topped with bean jelly, pickled vegetables, egg, tomatoes, and beef. A special garlic sauce barely seen in the background was recommended to combine with this dish. The namesake lagman ($9.50, below) is called thon lamian on the menu and painfully good. The beefy broth and rib-sticking heavy noodles would make a wonderful winter meal, but even in late spring we were in awe. A homemade pepper sauce that was brought out (not pictured) paired very well with the richness of this bowl. 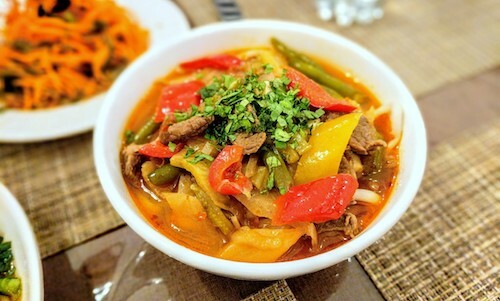 Our server described lagman (lamian) as originating in their culture, describing what Uzbeks and others make as kind of a knockoff. 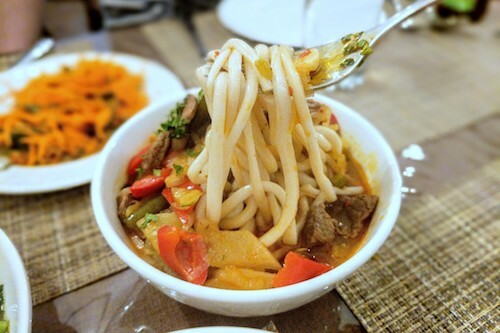 Regardless of origins, this version rises right to the top of the city's best list of lagman. 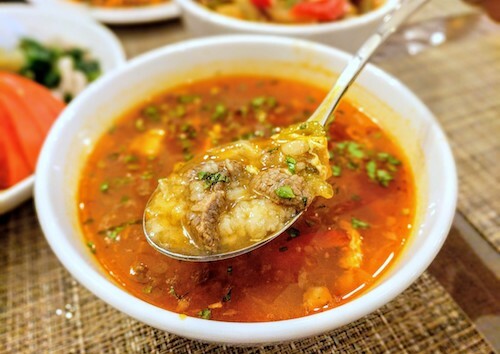 Described as "minced dough," we also really enjoyed the less hearty but just as flavorful ban thon ($7.99, below), another Dungan-style beef soup. Their ways of spicing these soups are familiar and unfamiliar at the same time, it's definitely like enjoying something for the first time while having a deep feeling for it from your past. I do not know how to describe it any other way. Our only swing and miss on the evening was braised meat ($10.99, below), which came sizzling like fajitas but tasted more like an American-Chinese dish that swapped out the broccoli for tomatoes and bell peppers. 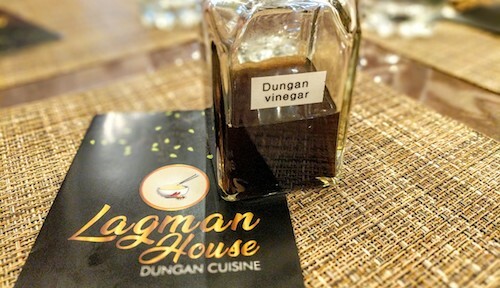 We later learned this is in fact not from Dungan kitchens, which made sense as its sweet flavors really stood out from the rest of the meal. 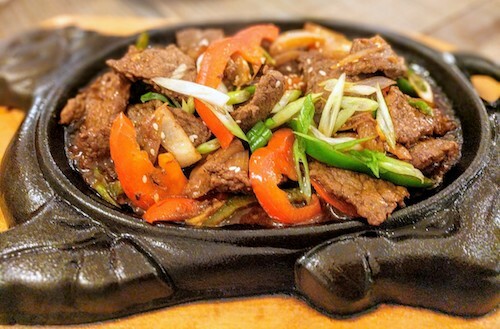 Eager to end the meal on a high note, we asked for the Huascu Dungan style ($15.99, below), which takes 15-20 to prepare. 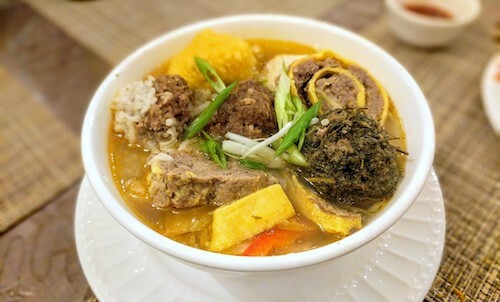 This beef broth is full of pickled cabbage and topped with all types of different meatballs, something of a unique part of the culture as they prepare them all individually. When the ton momo ($6.99, below) arrived, our server again apologized for the "high" price of the very small dessert, explaining that the process of creating it was very difficult. Of course we were not about to get upset about trying something so new and unique, and were delighted enough to order a second that was eventually given to us free. 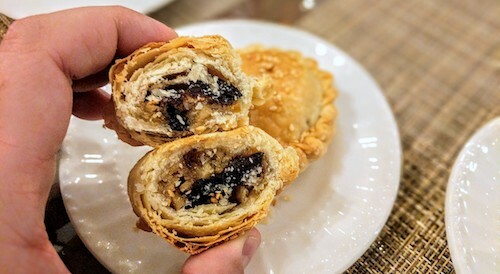 These flaky buttery pastries are definitely a good end to the meal, and somehow you can taste all that extra expense in the small bites. 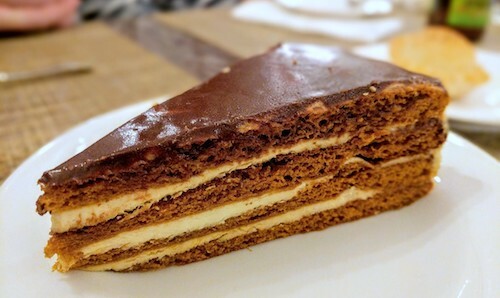 Asked if this was just a normal Russian-style honey cake ($5.99, below), we were told that this was in fact a Dungan-style honey cake and were immediately sold. I must admit I am no honey cake expert though, and would not be able to tell the difference. Despite this, the honey cake we ate was extraordinary.